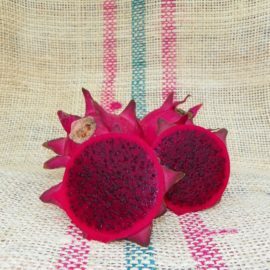 Yellow Cross 68 Dragon Fruit is a hybrid variety that comes from Hylocereus megalanthus (also known as Yellow Dragon) and an unknown Hylocereus species. 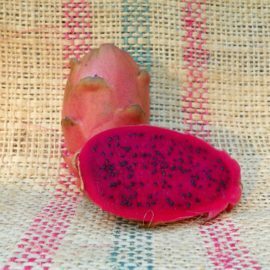 The fruit is oval in shape with small green fins on red skin along with a deep red flesh. The average weight of the fruit is between 8 and 12 ounces. The fruit had a mild tartness with a slightly earthy aftertaste. The fruits tested with a Brix rating of 15 and 16. Flower bud to flower was 21 days and flower to fruit was an additional 21 days. We fell if the fruit was on the vine longer the Brix rating could have been a little higher. The flowers of Yellow Cross 68 are night blooming that have white petals and deep red and yellow calyx (outer peddles). The flower resembles Yellow Dragon. The stems also resemble Yellow Dragon whoever they are thicker. This growth is three-sided with large sized thorns. Mature stems tend to get a thin waxy coating that will allow this variety to tolerate heat and cold better than Yellow Dragon. Our first fruit came from a 5-gallon container where it produced three flowers. From these three flowers, three fruits set with hand pollination. We are unsure at this time if Yellow Cross 68 can set fruit on its own. 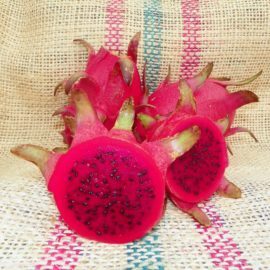 This Dragon fruit variety grows quickly and we experienced our flowers and fruit within one calendar year. We also felt this would be a great juicing choice due to its healthy deep red flesh and abundance of fruit. 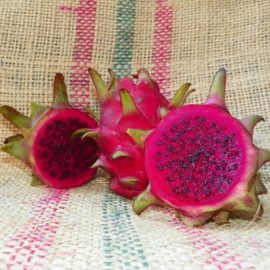 This variety was acquired from a grower in California.